Gaming and video-watching are the sexiest uses of Apple's iPad, but I love it for more a basic reason: It's a great tool for reading and writing. I use the iPad to keep up with the news, read longer articles and e-books, and write in both plain text and Microsoft Word. After two and a half months of nearly constant iPad use, I've learned a few tricks for making those experiences even better. Here's a roundup of the best tools I've found for reading and writing on the iPad. With its bright, crisp 1024-by-768-pixel display, the iPad was made for reading. Add the following apps to your iPad arsenal, and you'll never want to read on another device again. My main tool for keeping up with news is Reeder (US$4.99, from developer Silvio Rizzi). With Reeder, you subscribe to RSS updates -- called "feeds" -- which are available from nearly all blogs, newspapers and online magazines. Then, when you're ready to catch up with news, you open up Reeder and you see all of the new articles in a single place, either sorted by source or in chronological order or in folders that you set up. Reeder gives you convenient, easy-to-use tools to watch embedded YouTube videos, flag articles with a star for future reference, share them through services such as Twitter or e-mail, or send them to Instapaper or Read It Later, two Web services for storing articles for later reading. Reeder provides handy tools for saving and sharing articles. There are at least a half-dozen other feed-reader apps for the iPad, but I like Reeder the best. It's the easiest to use, and the functions I most care about, such as navigating through items, tweeting and sending links to Instapaper for later review, are accessible and attractive. Best of all, Reeder does a great job of formatting articles for easy reading. It makes good use of fonts, margins and line spacing in text. Reeder syncs with Google Reader, a popular, free Web-based feed reader, and requires that you have a Google Reader account. Google Reader is great on a full-size computer but clumsy on the iPad; Reeder fills the gap delightfully. Reeder also has a version optimized for the iPhone (US$2.99). Reeder is good for short articles that you can swallow in one gulp, but what about those longer, discursive pieces in periodicals like The Atlantic and The New York Times Magazine ? That's where Instapaper comes in. I've written about Instapaper a couple of times before, and so has just about every other Apple blogger and journalist. Instapaper is more popular than a Twilight marathon at Girl Scout camp. But Instapaper deserves the praise -- it's a terrific application. 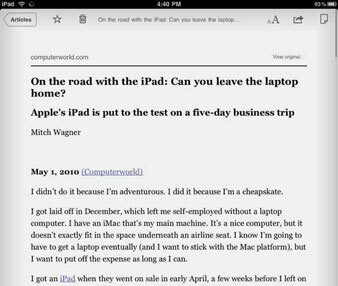 Instapaper Pro makes long online articles easy to read on the iPad. To use the basic (free) Instapaper service, you install a Read Later bookmarklet in your desktop or mobile Web browser. When you're wandering around the Web and you find an article that's worth reading, but you don't have time to read it right then, just click the bookmarklet and the Web service saves the article for you, for later reading. When you have time to read, go back to the Web site or -- even better -- read it on the iPad, using the Instapaper Pro app (US$4.99). The app formats articles for attractive and easy-to-read display, with good use of fonts, margins and spacing. Instapaper also works with third-party apps like Reeder and several Twitter apps. If someone tweets a link to an interesting article, you can send the article to Instapaper and read it later.